The HMHS Britannic was a British passenger ship. The ship was also used as a war ship and a Royal Mail steamer. The Britannic was finished on 26 February 1914, for the White Star Line. It was a sister ship to the Olympic and the RMS Titanic. The building of the ship was held up when the Titanic sunk, and extra safety items were added to the Britannic. 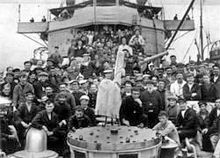 The start of World War I meant the ship was not used for passenger work. It was set up as a hospital ship with 3,300 beds. She sailed to Mudros on the 23 December 1915, to pick up wounded soldiers from Gallipoli. She continued as a hospital ship until 1916 when it was turned back into a Royal Mail and passenger ship. Before this latest change was carried out, the ship was called back into war service and went back to Mudros. 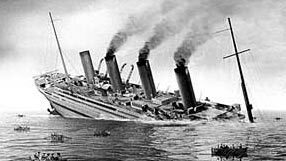 Britannic sinks after hitting a mine. On 21 November 1916 the Britannic hit a naval mine in the Zea Channel, off the Greek island of Kea. The mines had been put there by the German submarine U-73. A huge explosion tore a hole in the side of the ship which sunk one hour later. The ship which was carrying 1,125 people, and nearly all were saved. Two lifeboats were struck by the ship's propellers and 30 people were killed. The German newspapers claimed that the ship had been sunk by a torpedo because it might have been carrying soldiers. The captain of the U-73 said this was not true, he had only been laying the naval mines. Wikimedia Commons has media related to Britannic (ship, 1915). ↑ 1.0 1.1 1.2 1.3 1.4 1.5 "HMHS Britannic". www.ocean-liners.com. Retrieved 2009-07-18. This page was last changed on 2 March 2017, at 08:40.